Mon Valley Veterans of World War II. Please note that this does not include all Mon Valley Veterans. 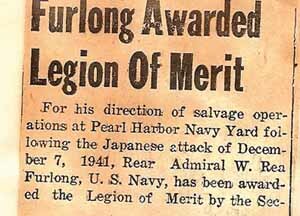 For his direction of salvage operations at Pearl Harbor Navy Yard following the Japanese attack of December 7, 1941, Rear Admiral W. Rea Furlong, U.S. Navy, has been awarded the Legion of Merit by the Secretary of the Navy, in the name of the President of the United States. Rear Admiral Furlong, former Chief of the Bureau of Ordinance, was aboard the U.S.S. OGLALA which was strafed, torpedoed and sunk as a result of the Japanese attack. Five days later--on December 12, 1941--he was made Commandant of the Pear Harbor Navy Yard, which post he still occupies. The American Legion Post at Pear Harbor recently named him the outstanding citizen of the Territory of Hawaii. 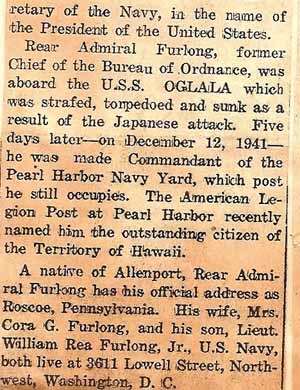 A native of Allenport [Pa], Rear Admiral Furlong has his official address as Roscoe, Pennsylvania. His wife, Mrs. Cora G. Furlong, and his son, Lieut. William Rea Furlong, Jr., U.S. Navy, both live at 3611 Lowell Street, Northwest, Washington, D.C.
After 44 years as a member of the U.S. Navy, Rear Admiral W. Rea Furlong has reached retirement age and has been succeeded as commandant of the Pearl Harbor Navy Yard by Rear Admiral Edward W. Hanson. 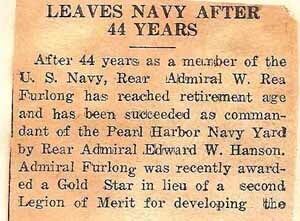 Admiral Furlong was recently awarded a Gold Star in lieu of a second Legion of Merit for developing the Navy Yard to meet the needs of the Pacific theatre of war. The admiral, son of Mrs. E. A. Furlong, local druggist, has had a full career in the navy, having had service on cruisers, was commander of a division of destroyers and captain of four different battleships. 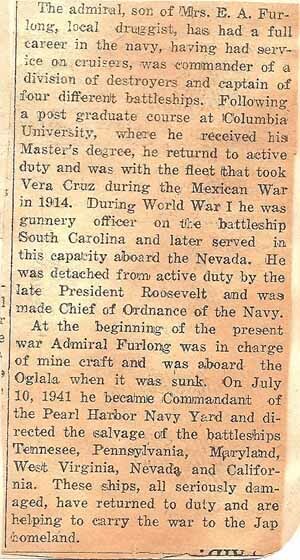 Following a post graduate course at Columbia University, where he received his Master's degree, he returned to active duty and was with the fleet that took Vera Cruz during the Mexican War in 1914. During World War I he was gunnery officer on the battleship South Carolina and later served in this capacity aboard the Nevada. He was detached from active duty by the late President Roosevelt and was made Chief of Ordinance of the Navy. 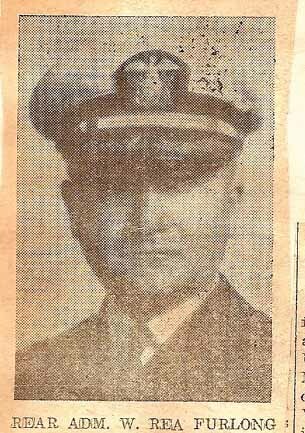 At the beginning of the present War [WWII] Admiral Furlong was in charge of mine craft and was aboard the Oglala when it was sunk. On July 10, 1941, he became Commandant of the Pear Harbor Navy Yard and directed the salvage of the battleships Tennessee, Pennsylvania, Maryland, West Virginia, Nevada and California. These ships, all seriously damaged, have returned to duty and are helping to carry the war to the Jap [sic] homeland. 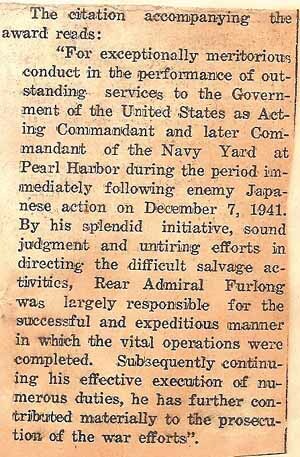 "For exceptionally meritorious conduct in the performance of outstanding services to the Government of the United States as Acting Commandant and later Commandant of the Navy Yard at Pearl Harbor during the period immediately following enemy Japanese action on December 7, 1941. By his splendid initiative, sound judgment and untiring efforts in directing the difficult salvage activities, Rear Admiral Furlong was largely responsible for the successful and expeditious manner in which the vital operations were completed. Subsequently continuing his effective execution of numerous duties, he has further contributed materially to the prosecution of the war efforts." Roscoe PA is located at 40°4′43″N, 79°51′55″W (40.078513, -79.865225). Stockdale PA is located at 40°5′0″N, 79°51′2″W (40.083348, -79.850456). Allenport is located at 40°5′47″N, 79°50′43″W (40.096260, -79.845278). Allenport, near the Monongahela River, is just past Stockdale. California High School is in California, PA. Note: These are all GR1 locations per Map sources/GeoHack on Wikimedia Tools. © 2006, 2006, 2007, 2008, 2009, 2010, 2011, 2012, 2013 Judith Ann Florian, all rights reserved. Website is updated weekly or monthly, as I receive submissions or when I complete a transcribing project. The materials (files) located on this website are the property of the webmaster and the contributors. Material is for personal research and may not be included in any for-fee collection or publication.